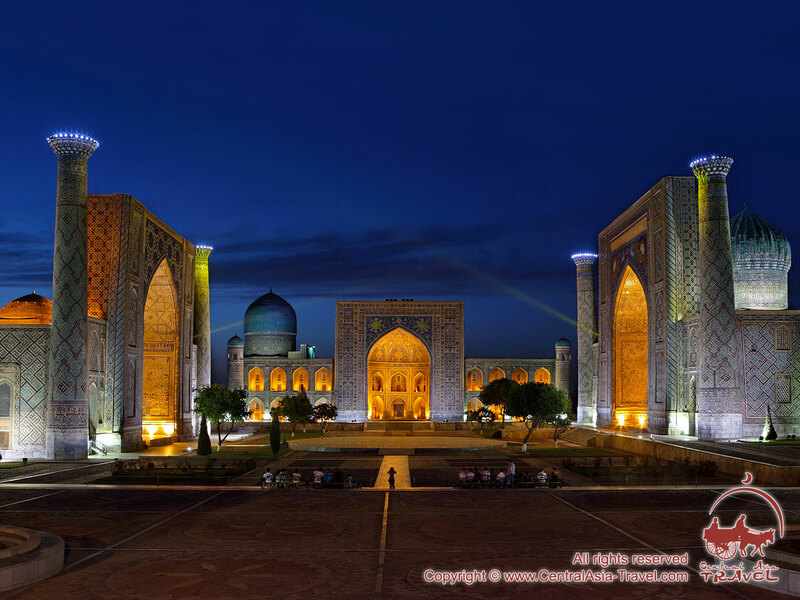 Located in the center of Samarkand, the Registan Square with its medieval edifices is certainly one of the most impressive squares in the world. The legend has it that the square was a place of public executions from the 15th to the early 20th centuries, and they strew it with sand to absorb the blood shed there. 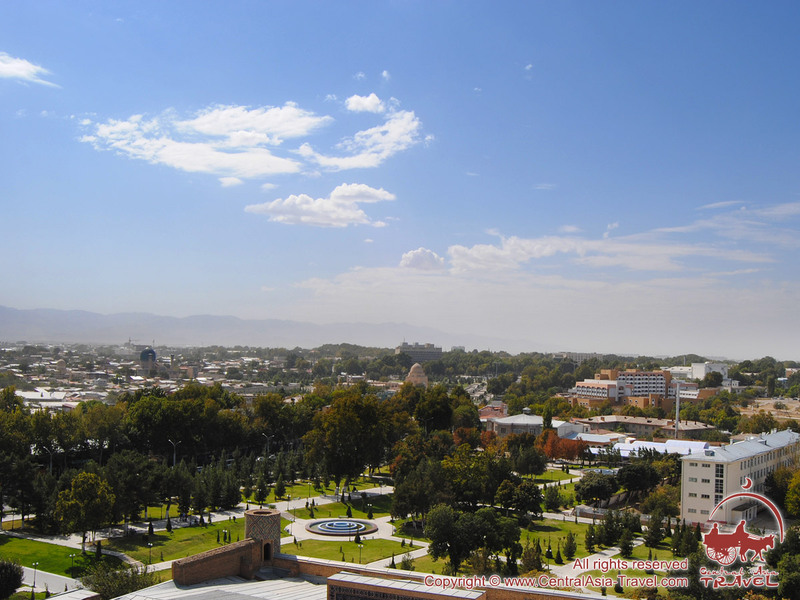 Therefore, the square was named Registan: reg (‘sand’) and stan (‘place’) - ‘a sand place’. It was also a place where people, summoned with trumpets, gathered to listen to government decrees announced. Initially, at the beginning of the 15th century, the square did not have the grand madrasahs standing on its three sides today. (A madrasah is an Islamic college; also spelled madrasa, madarasaa, medresa, madrassa, madraza, madarsa, medrese.) They were built later, in the 15th and the 17th centuries. 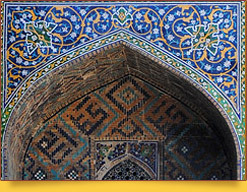 The Registan Square, paved with fired bricks and cobbles, and the architectural ensemble of its three edifices, masterpieces of medieval Islamic architecture, have been UNESCO World Heritage Sites since 2001. 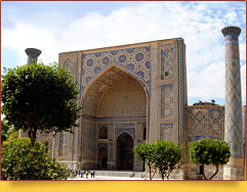 The central building of the ensemble is Tilla-Qori Madrasah (also spelled Tilla-Kori, Tillya-Kori, Tilya-Kori, Tilla-Kori); Ulugbek Madrasah (also spelled Ulugh Beg, Ulughbeg, Ulugh-Beg) and Sher-Dor Madrasah (also spelled Sher Dor, Sherdor, Shir Dor, Shirdor) stand to the left and right of it respectively. The madrasahs date from different times. 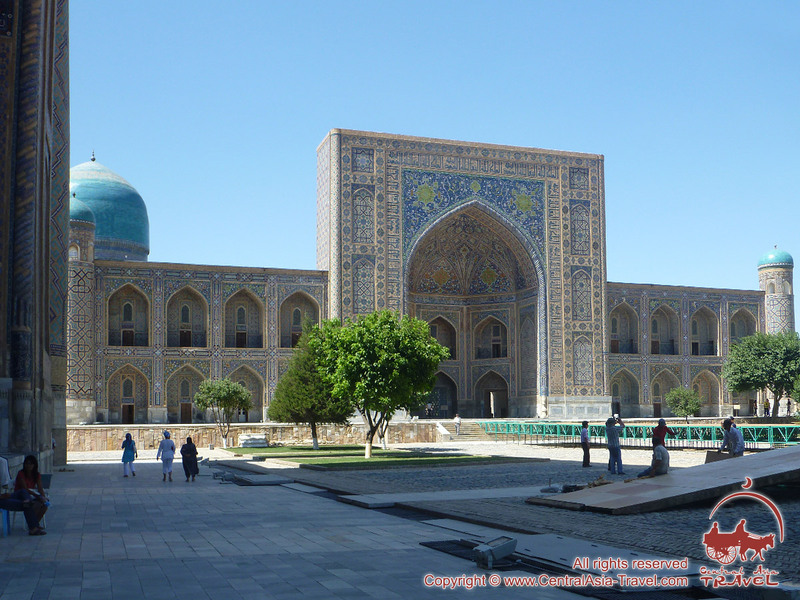 Ulugbek Madrasah, the earliest of them, was built in 1417 - 1420 by order of Ulugbek, Tamerlane’s grandson. 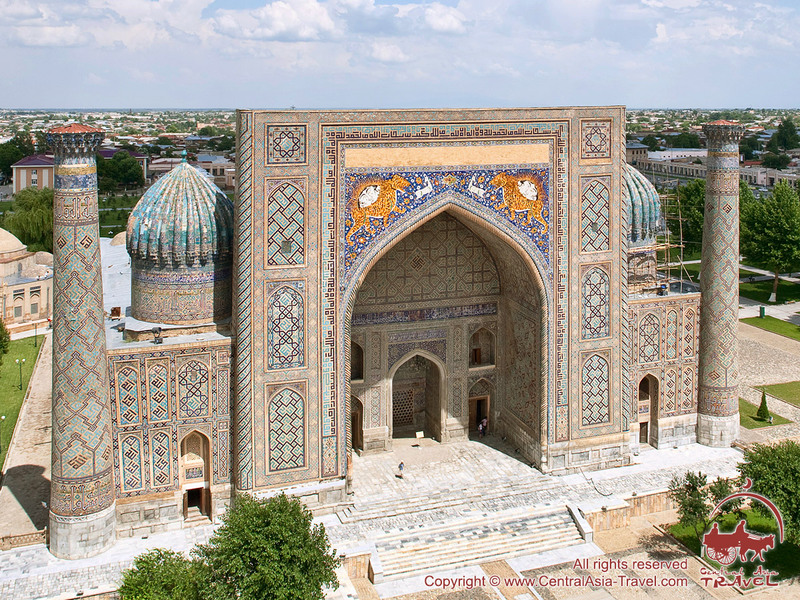 Two centuries later, by order of Samarkand governor Yalangtush Bahadur (also spelled Yalangtush Bakhodur, Yalangtosh Bahodir) Sher-Dor Madrasah and Tilla-Qori Madrasah were built. They replaced the khanaka (a Sufi hospice and monastery; also spelled khanqah, khaniqah, khanqa, khaneqa, khanegah, khaneqah) and the caravanserai that had been built under Ulugbek. 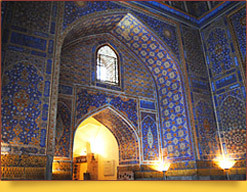 Each of the madrasahs features unique decorations: fascinating tile mosaics, delicate stone carvings, splendid gilt ceilings, etc. 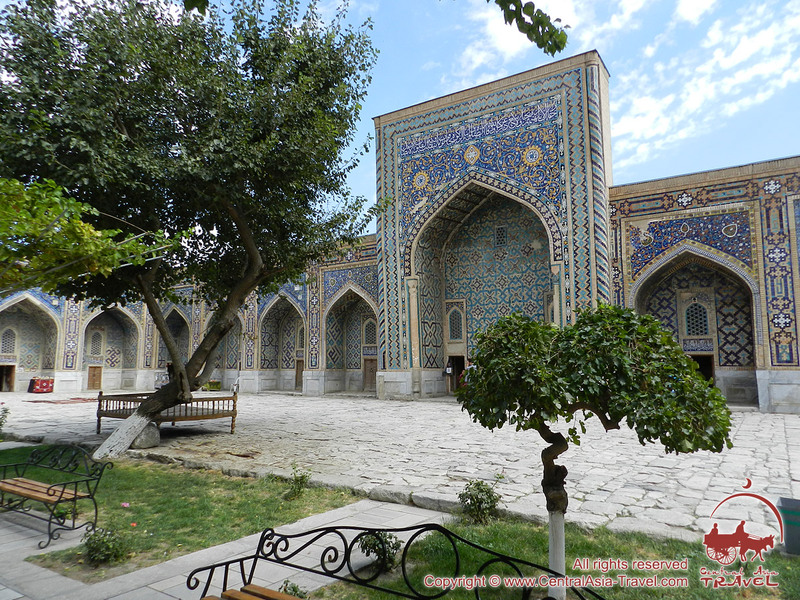 There was a period when Registan Square madrasahs stayed in a state of disrepair and were empty. 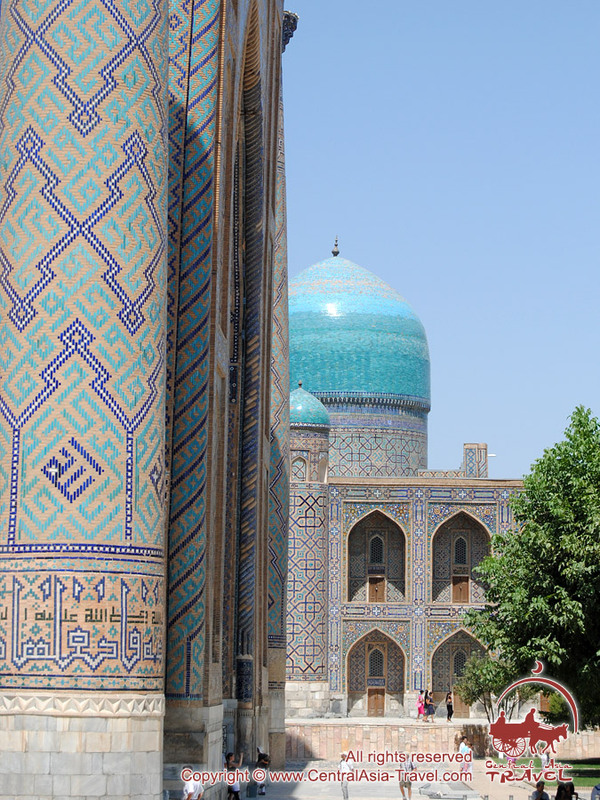 In the 17th - 18th centuries, Samarkand was in crisis: the khanate’s capital had been moved to Bukhara, and the Silk Road highway passing through the city had ceased to function. 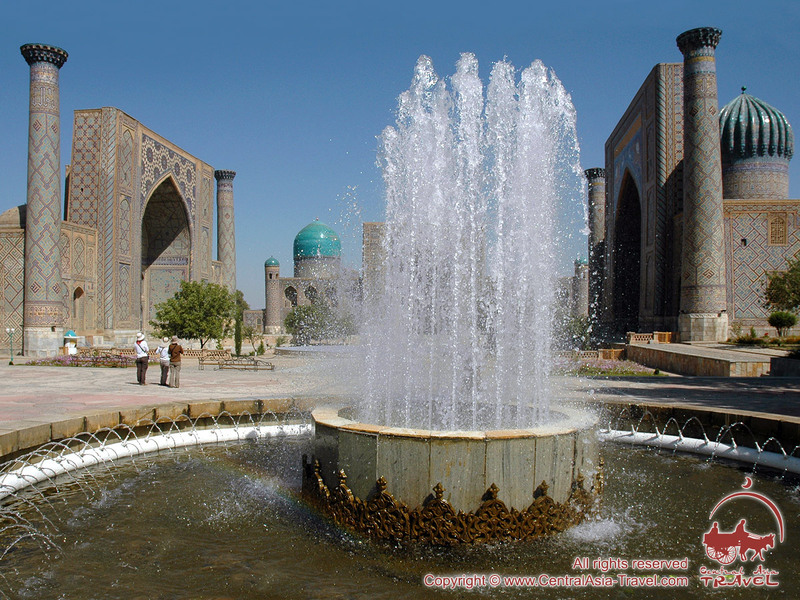 At the end of the 18th century Samarkand came back to normal life again, with a lot of shops and other small facilities opened in the square. In 1875, the square was leveled and paved, and became the major city center again. Today various festivals, holidays and shows are held in the square. 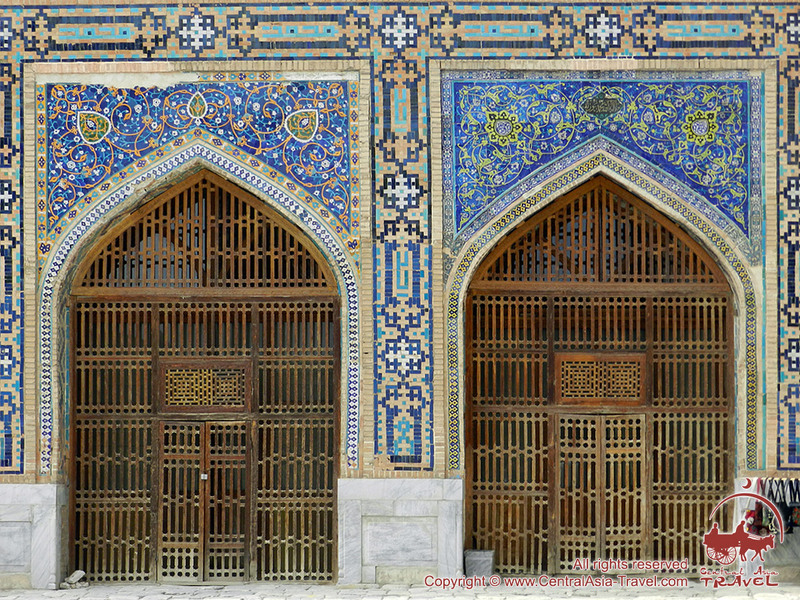 The madrasahs have been fully restored by now and are open for visitors. There is a number of shops offering local handicrafts housed in them. 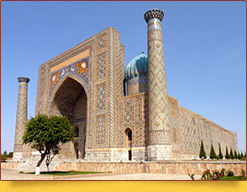 Ulugbek Madrasah was built by order of Ulugbek, Tamerlane’s grandson, in 1417-1420. 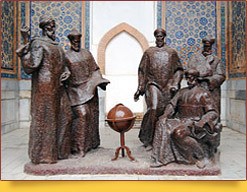 Called a scientist on the throne, Ulugbek was a prominent astronomer of his times and an ardent promoter of education, science and art in his kingdom. The madrasah had turned out probably the most beautiful building he had ever ordered to erect. 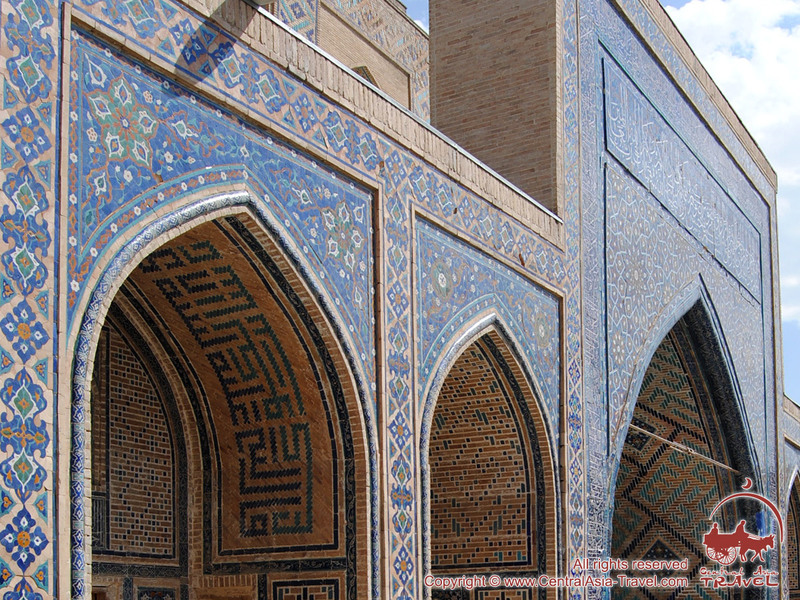 The façade of the structure facing the Registan Square features a magnificent 34.7-meter-high pishtaq portal (a projected rectangular portal) of the main iwan entrance (a vaulted space in it). 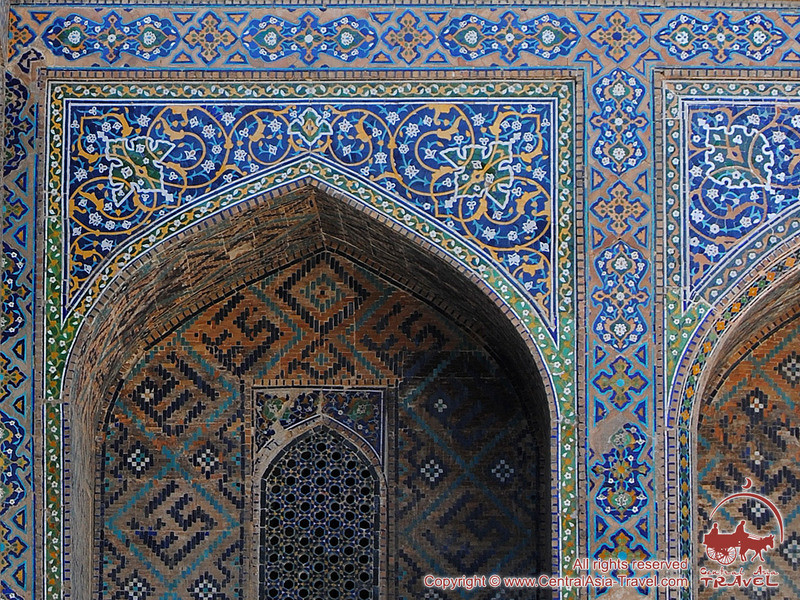 The portal is covered with intricate geometric and star-shape mosaic designs, as well as bands of calligraphic inscriptions - all made of glazed tiles in prevalent shades of blue (as on most other Samarkand historic buildings). The either end of the façade has a minaret covered with geometric designs all over it too. 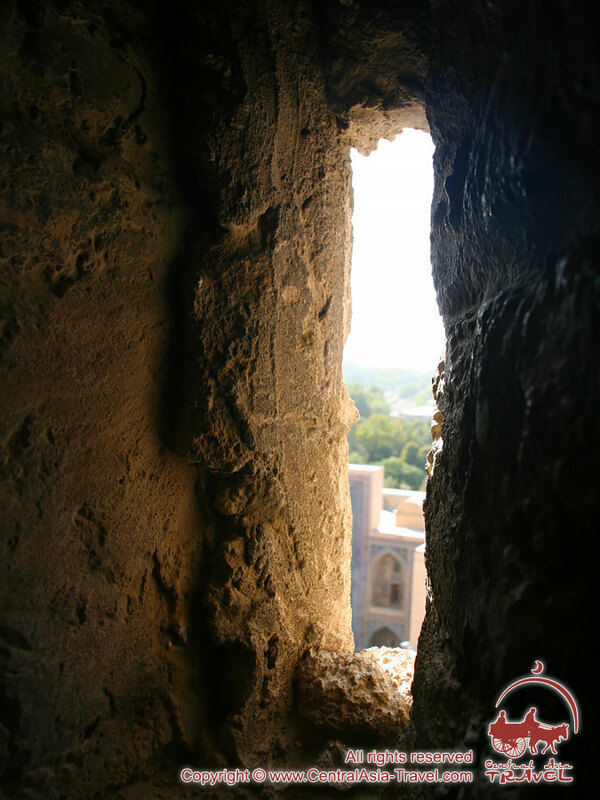 There were minarets at every corner of the buildings but only these two and part of the northwestern rear one survive. The front minarets, affected by the elements, had been leaning quite badly until they were fixed in 1922 and 1965. The building is rectangular; there is also a smaller iwan entrance on each of the three other sides. 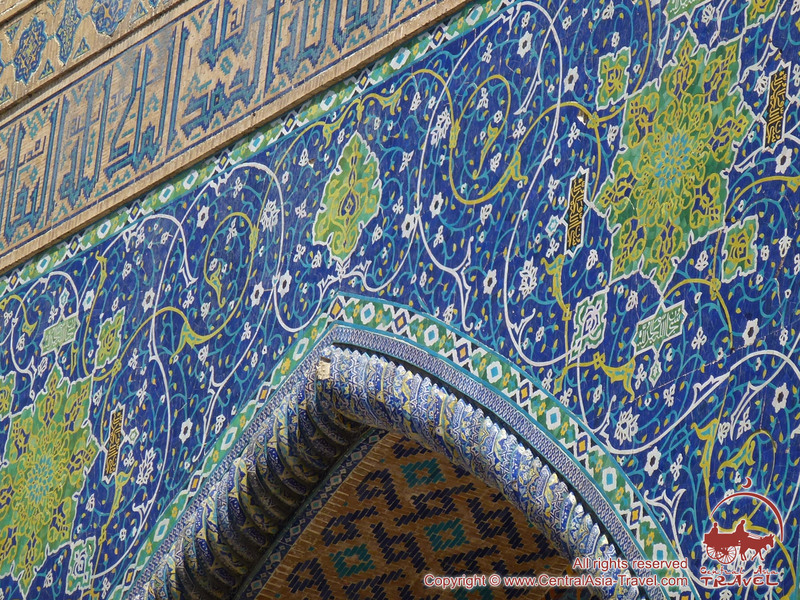 Decorated with tile mosaics, the iwan opposite the main portal is the entrance to the domed mosque the madrasah incorporates. 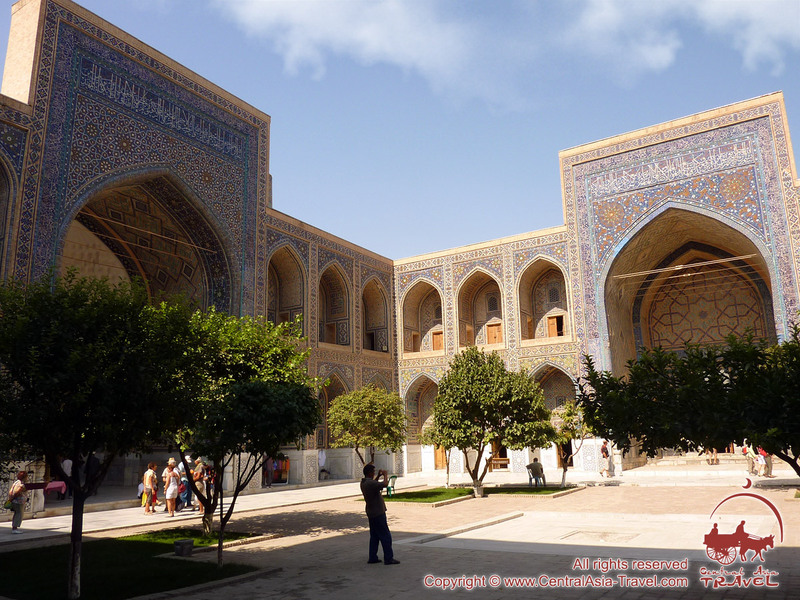 There were also lecture halls and two stories of 48 hujra dormitory cells along the square courtyard of the madrasah. During the 18th-century riots the second story and the four large domes of the lecture halls in the corners of the courtyard were removed: the local ruler was afraid that the insurgents might shoot at his palace from them. In the 1990s the second story, except for the domes, was restored. 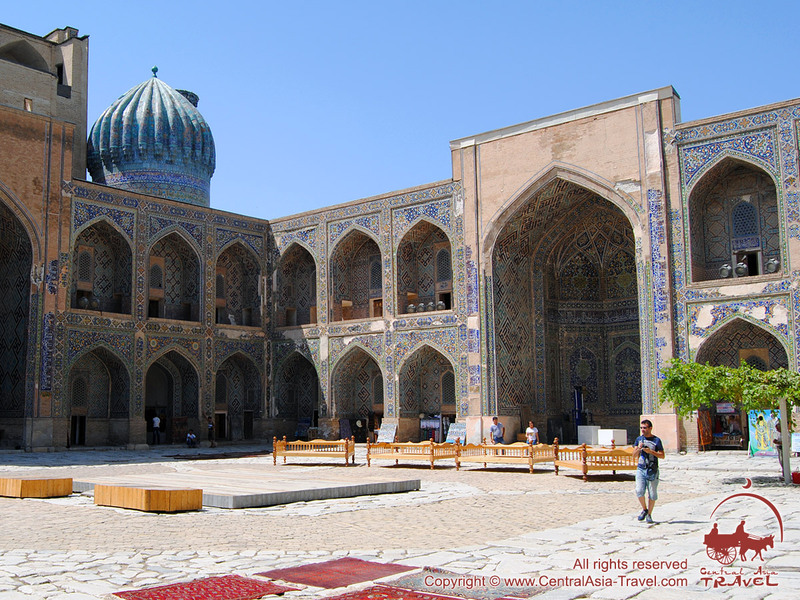 Though missing the domes, the building is a perfect example of Islamic elite architecture of the early Timurid times. The architect of it remains unknown though. 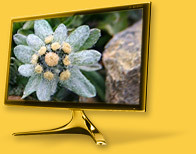 According to some historical sources, Ulugbek himself took part in designing it. 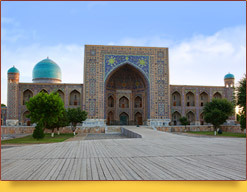 The madrasah was one of the world’s best Islamic colleges in the 15th century. The famous scholar and poet Jami (Nur ad-Din Abd al-Rahman Jami or Djami) was one of its graduates, for instance. 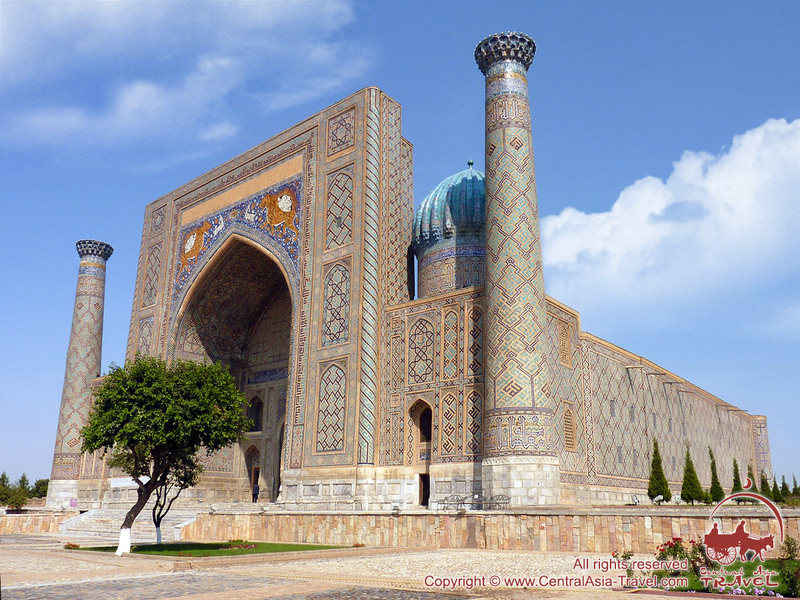 It was also a center of secular education and research during Ulugbek’s reign. 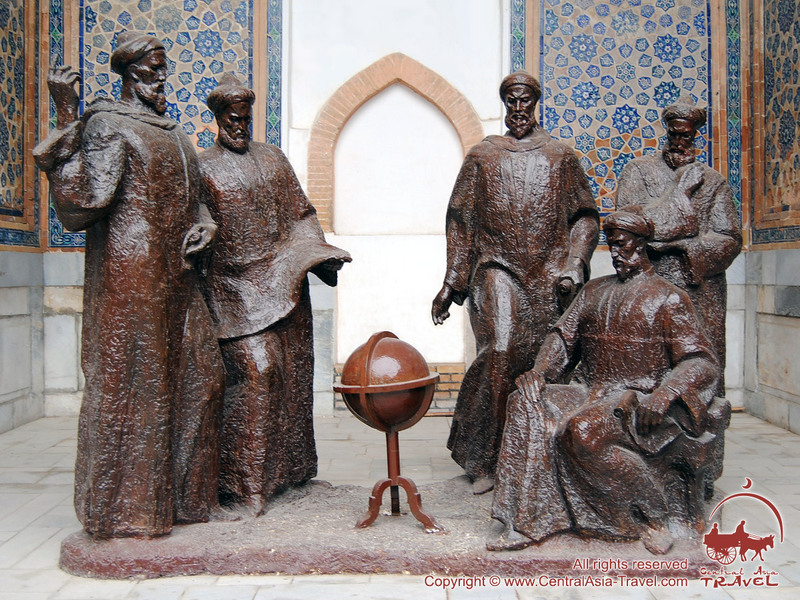 Among his lecturers were Ulugbek himself and Qadi Zada al-Rumi (actual name: Salah al-Din Musa Pasha), the ‘father’ of Samarkand scientists and ‘Plato of his times’, as he was called by his contemporaries. Ulugbek, much more successful as an astronomer than a king, whose world-famous star catalogue was the best between Ptolemy’s and Brahe’s, was killed by order of his son Abdulatif on October 25, 1449. His body was left on the doorstep of his modest home inside the madrasah. 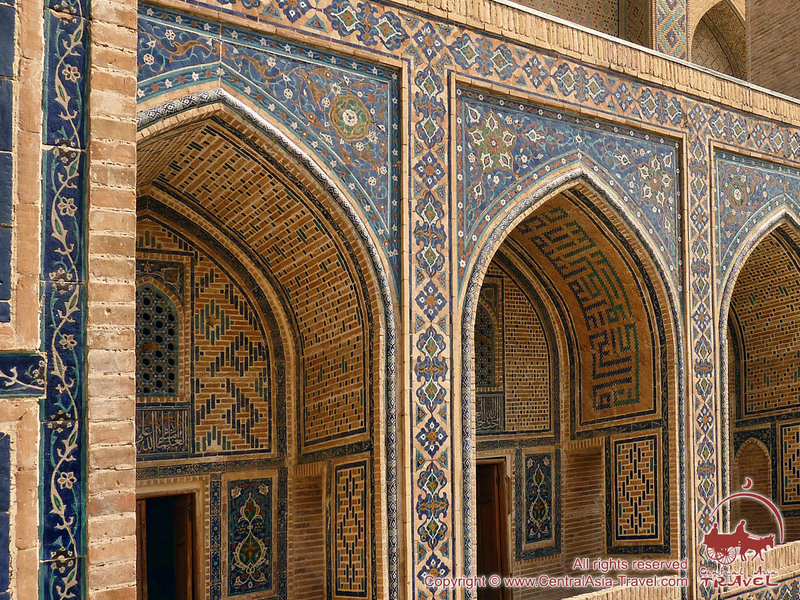 Sher-Dor Madrasah, which translates as ‘possessing lions’, was named after the mosaic motif on the upper part of its pishtaq portal. Reflecting each other on the right and left parts of the tympanum, it is a tiger-looking beast with a mane - some sort of a tiglon - pursuing some sort of a white fallow deer, and a segment of the personified sun over the tiglon’s back: either watching the hunting scene or just rising out. 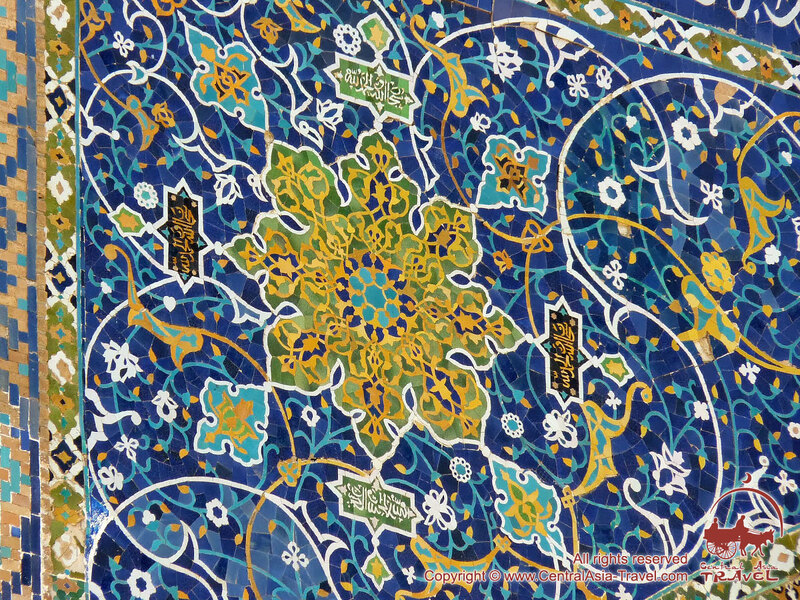 This mosaic motif is unique to medieval Islamic historic buildings, since depicting animals and people is against sharia. However, the designers of the madrasah seem to have tried to find a compromise: the creatures are fantastical, and the human face of the sun has both male and female features. Why Yalangtush Bahadur decided to use this motif, provoking Muslim clergy, is only a supposition. 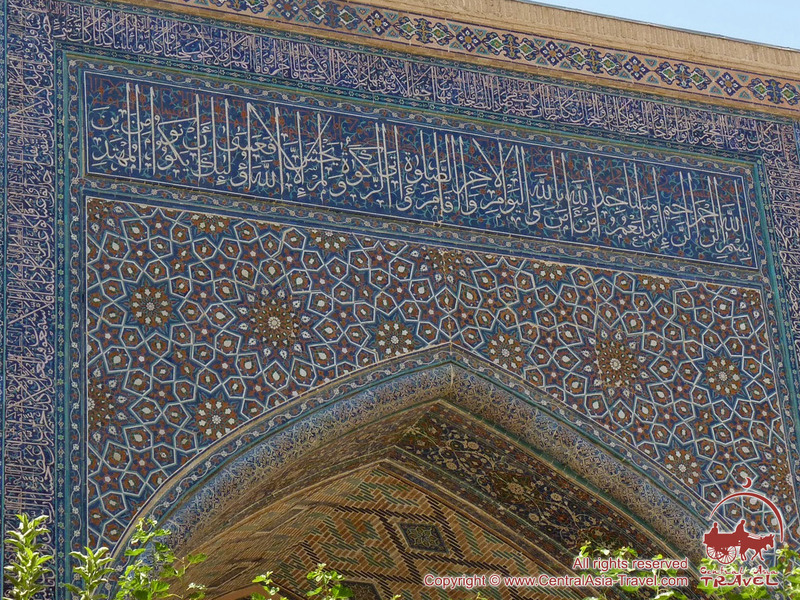 Some scholars say he wanted to highlight it because it was a popular Samarkand symbol of power, a Persian symbol Samarkand had borrowed. (Iran’s emblem before 1979 was a lion with the sun too.) By the way, today’s Samarkand seal features a snow leopard - another member of the large cats family... Whatever the reason was, the mosaic turned out to be a unique Central Asian piece of art and one of Uzbekistan’s identity emblems. Sher-Dor’s tiglon and the sun is even printed on the country’s 200-som banknote. Sher-Dor Madrasah was built on the site of the dilapidated khanaka right across from Ulugbek Madrasah in 1619 - 1635/36. Its portal was supposed to be a reflection of Ulugbek Madrasah portal, but they managed to achieve it only to a certain extent. 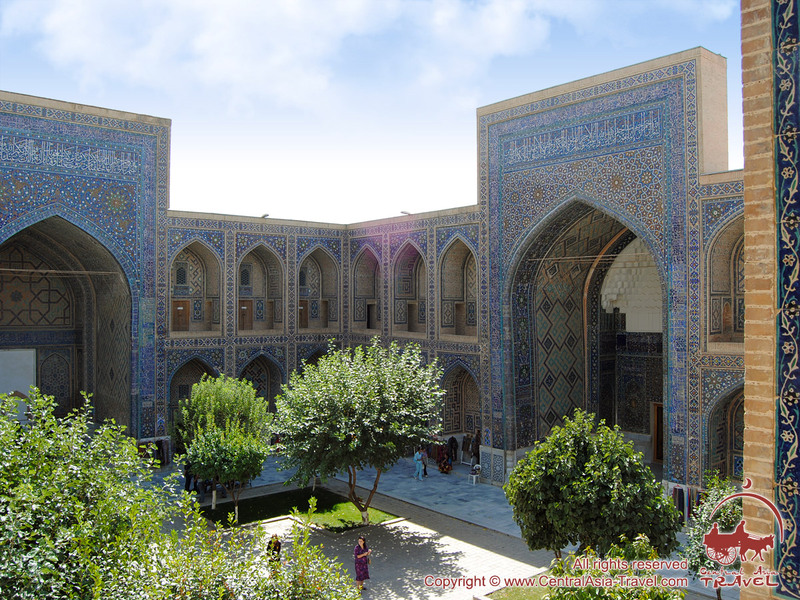 The architect had not allowed for the two-meter elevation difference between the madrasahs (Sher-Dor’s site was higher), so they had to shorten the structure to be level with Ulugbek Madrasah. 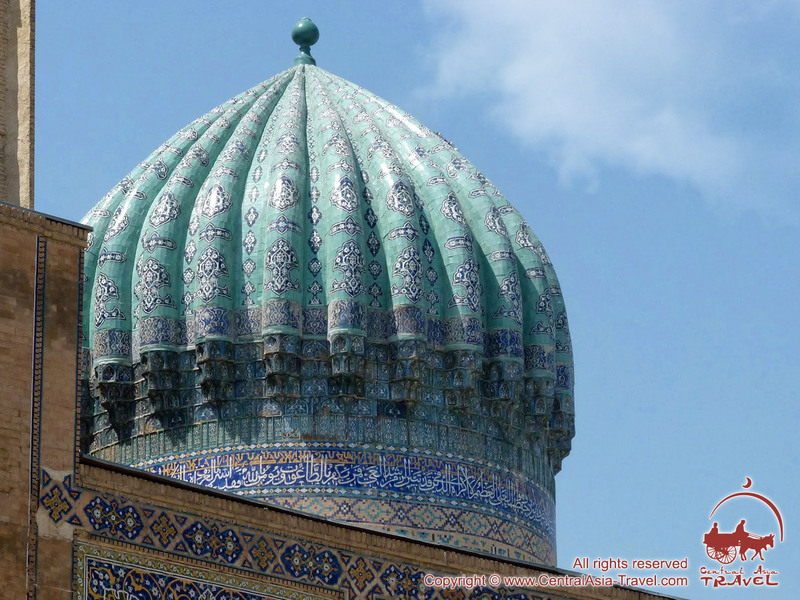 Sher-Dor Madrasah still features two impressive ribbed domes flanking its portal (Ulugbek’s once had such domes too.) The structure is a rectangle in plan too, though shorter, for there is not a mosque at its end. 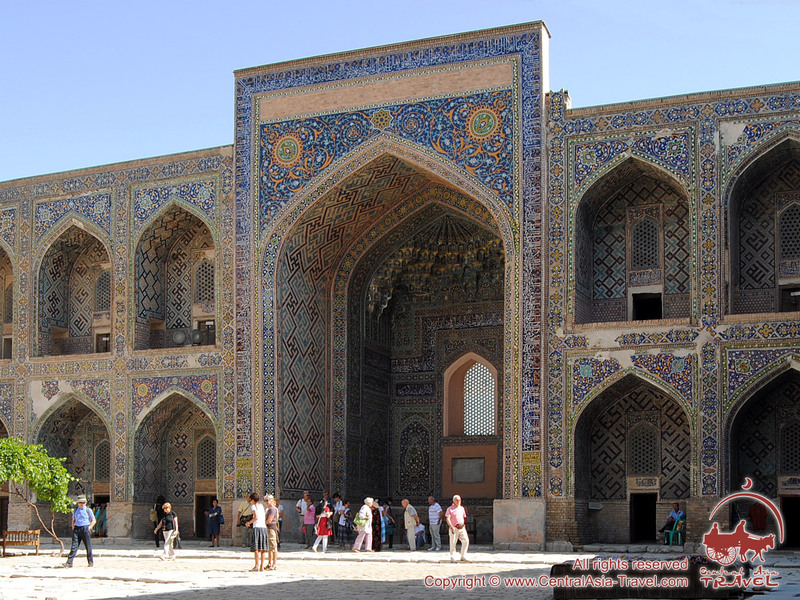 In contrast with Ulugbek Madrasah, Sher-Dor hudjra cells are of one room only; the eastern façade features wall-hiegh three-quarter towers, not minarets. 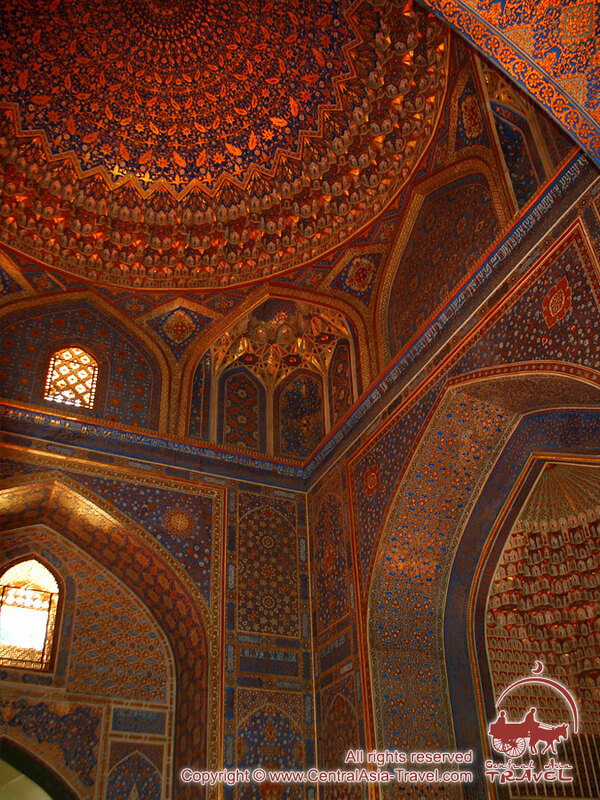 The side iwan niches facing the yard have multifaceted semi-spherical ceilings Ulugbek Madrasah has never had. 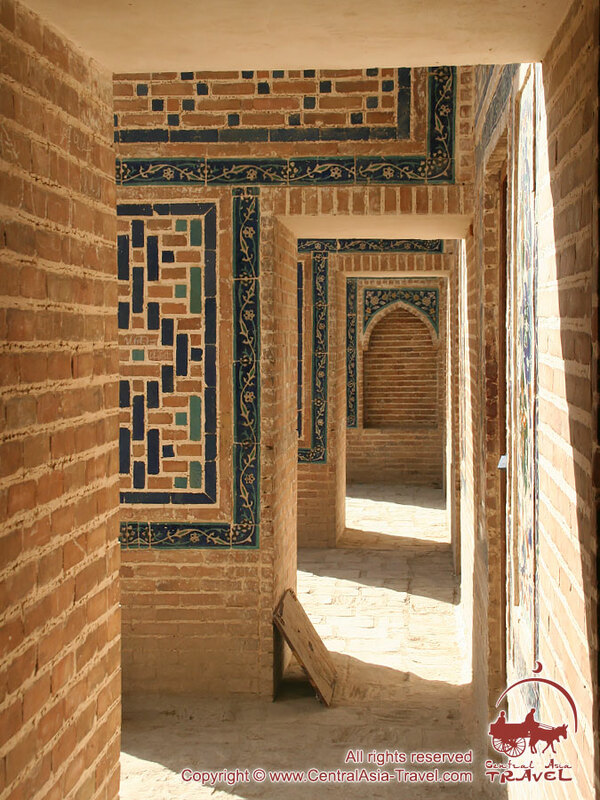 Sher-Dor madrasah is also richly decorated with glazed bricks and tiles, forming various mosaics and intricate girikh geometrical patterns (‘Persian knots’) designed to look discernible from a distance. 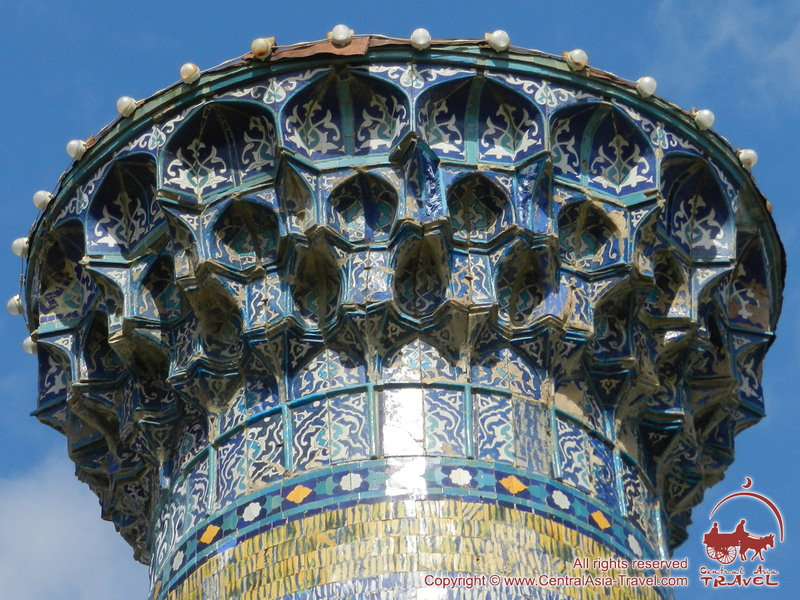 The friezes of the minarets and the dome drums are covered with ornamental inscriptions in Arabic. 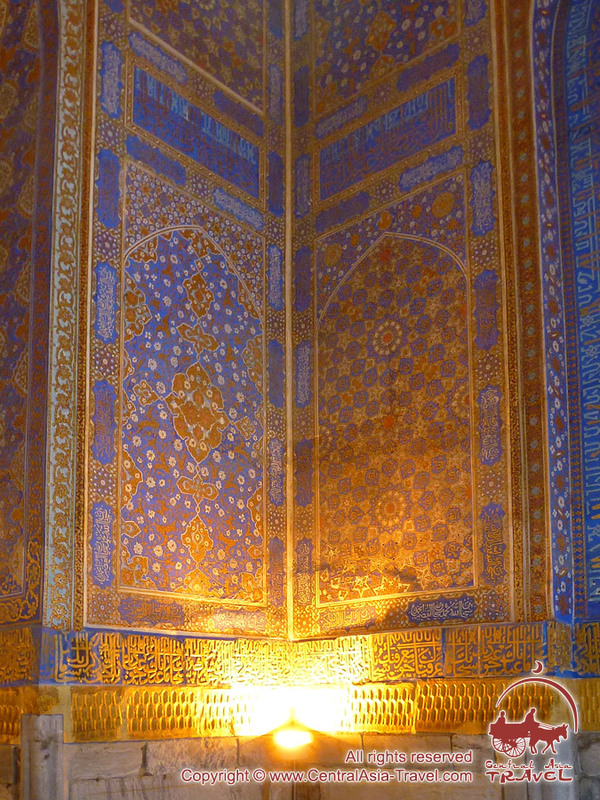 The upper parts of the hudjra cell arches, the interior of the lecture hall and many other surfaces of the madrasah feature very fine floral designs and arabesques - gilt and multicolored. Sher-Dor Madrasah has survived a few earthquakes, with considerable damages though. In the 1920s and 1960s it was restored completely. 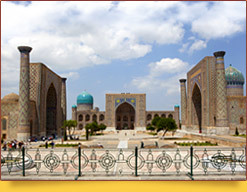 For almost three centuries the madrasah was quite a prominent Islamic college, although behind Ulugbek Madrasah in prestige. Despite its size, only around 40 students could study in it. Among its graduates was Shihabetdin Marjani, the famous Tatar theologian and a member of the Sufi order of Naqshbandi (1818-1889). Yalangtush Bahadur ordered to build Tilla-Qori Madrasah (‘gilded’) on the site of Mirzo Caravanserai, also dilapidated, in 1646 - ten years after Sher-Dor Madrasah had been finished. They completed Tilla-Qori Madrasah in 1660, after the governor had already died. The mosque is a cross in plan, featuring a beautifully decorated mihrab - a niche in the wall of a mosque that shows the direction of Mecca Muslims should face when praying - and an 11-stair marble minbar pulpit. The interior walls and cupola of the mosque boast rich gilt ornaments; hence the name of the madrasah translates as ‘gilded’. The four-iwan yard is surrounded with hujra cells: the main façade wings have two stories of them; the other three sides have only one. The inside and outside yard facades are covered with brick and tile geometric, floral and inscriptional mosaic designs. 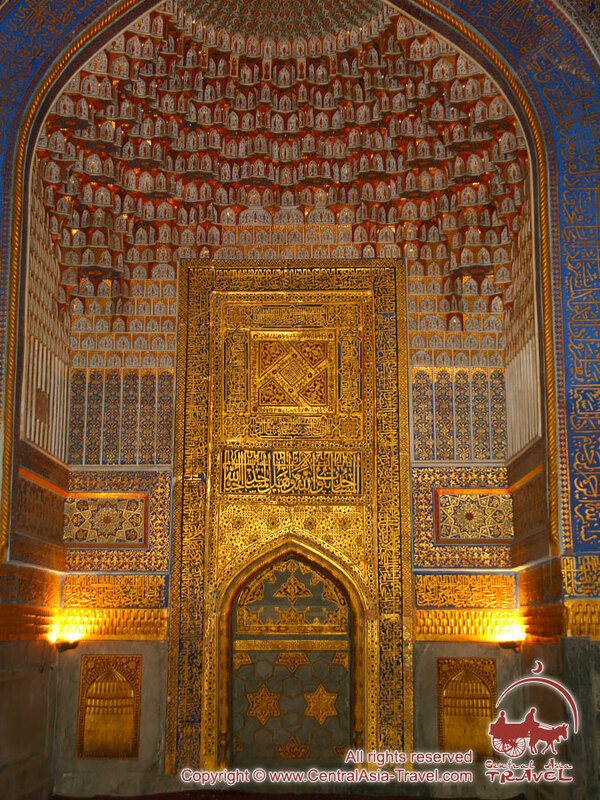 At the beginning of the 19th century a strong earthquake destroyed the upper part of the main portal of the madrasah. 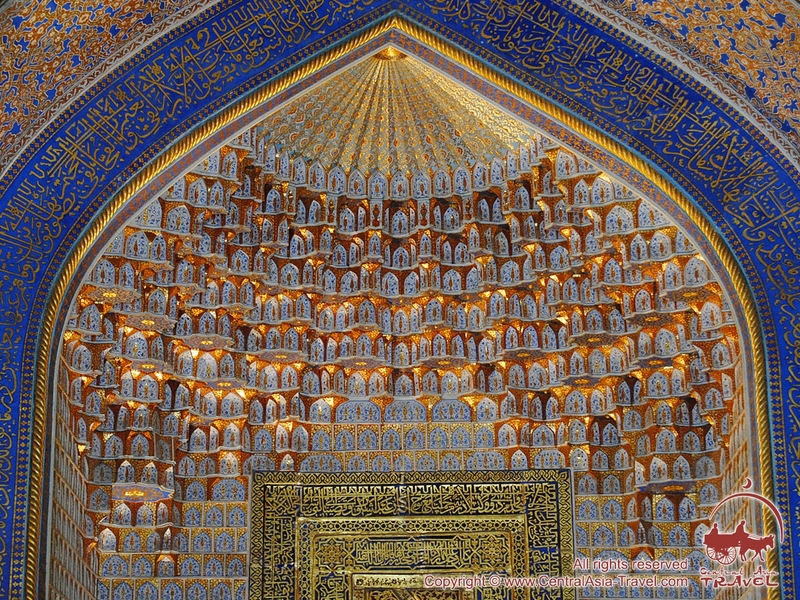 It was restored during the reign of emir Khaidar (1800 - 1826), except for the mosaic decoration though. The restoration work on the décor and exterior ornaments continued and was completed in the 20th century: in the 1920s, 1930s, 1950s and 1970s. 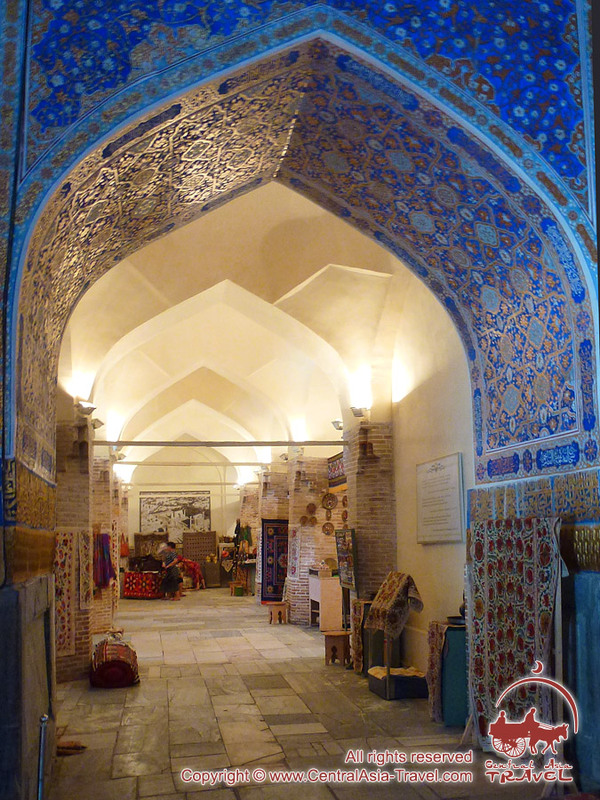 Today Tilla-Qori Madrasah houses the Registan restoration museum. 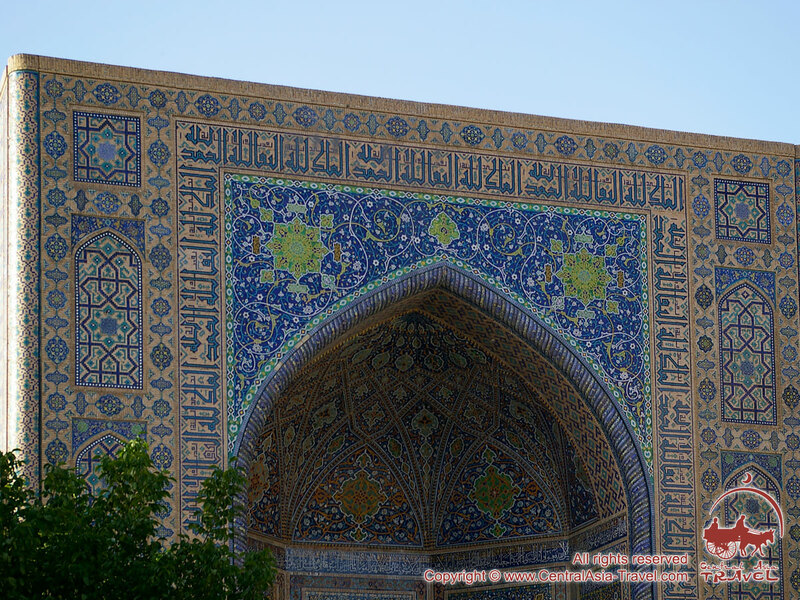 Located to the east of Tilla-Qori Madrasah is the Mausoleum of the Shaybanids - a dynasty that ruled the Khanate of Bukhara and Khorezm from the early 16th to the late 17th centuries. The mausoleum has a large number of tombstones, the oldest of which dates from the 16th century. 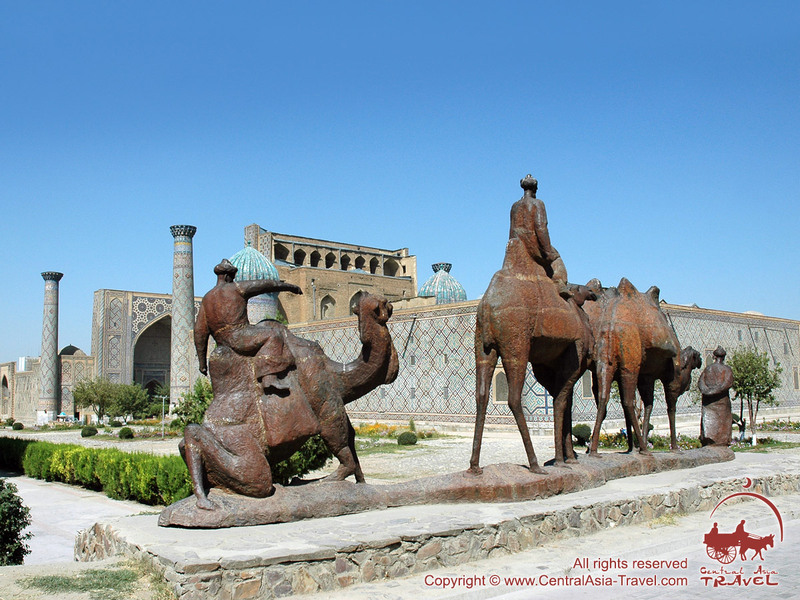 Behind Sher-Dor Madrasah stands Chorsu Trading Dome, evidence that Registan was the center of trade in medieval Samarkand. This hexagonal domed structure was built in the 15th century and rebuilt in the early 18th century. The building was restored in 2005; they had to remove three meters of soil to open it all above the foundations. Now Chorsu Trading Dome houses an art gallery where works of Uzbek artists and sculptors are exhibited.